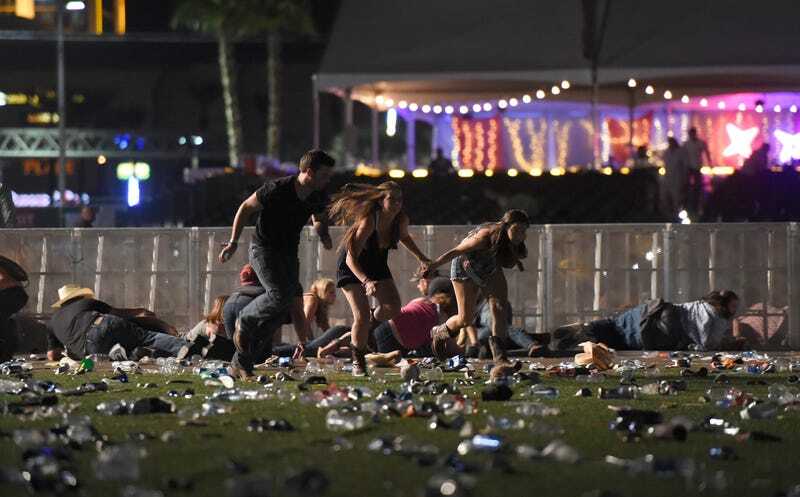 Last night, the deadliest mass shooting in modern American history occurred at a country music festival in Las Vegas. More than 50 people were killed and at least 400 were injured during the shooting, according to the latest numbers from CNN. It was carried out by a lone gunman during Jason Aldean’s headlining set on Sunday night. The shooter has been identified as Stephen Paddock, a 64-year-old resident of Mesquite, Nevada. He was set up on the 32nd floor of the Mandalay Bay Hotel with 10 rifles and a clear view of the festival crowd outside. Police believe Paddock killed himself before they burst into his hotel room, and that he’s a lone-wolf actor. He’d been staying at the Mandalay Bay since Thursday, the Sheriff Joseph Lombardo told CNN. Aldean was headlining the Route 91 Harvest Music Festival to a crowd of 22,000 when it burst into chaos just after 10 p.m. local time. It was the fourth year of the festival, which was billed as a “neon sleepover,” with some of the biggest names in country, including Eric Church, Sam Hunt, Jake Owens, and more. UPDATE (6:20 p.m.): The New York Times reports that the death toll has risen to 59, with 527 others injured. Police found at least 20 rifles in the hotel room, and Paddock used a hammer to smash out the windows. Earlier today, the Islamic State claimed that the gunman was one of its soldiers, but the F.B.I. claims that it has no evidence so far suggesting that he had ties to an international terrorist organization.